The RFG AGM and members meeting in Sunderland in November was a sad day for Tony Berkeley as he relinquished his role of RFG Chairman after more than 20 years. He is pleased to see the organisation in such a good state “These meetings are great for the exchange of business and ideas – and are fun! We are a repository of a can-do attitude in the railways and associated industries,” he said. Tony will, of course, continue to advocate the cause of rail freight in the House of Lords and elsewhere. 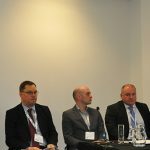 The potential for rail freight, and the importance of rail for regional regeneration was emphasized by the first speaker Paul Olvhoj, Sale Manager for the Port of Sunderland. He explained that all companies talking to the port asked about the possibility of using rail and this had encouraged them to invest £2.5m in developing rail freight handling capability. He believes the main market opportunities include advanced manufacturing, agribulks, construction, automotive, offshore renewable energy and domestic multimodal. Jackey Leaper from the National College for High Speed Rail outlined the many courses and opportunities offered at the college for people at all levels and in all areas of the rail industry, despite the ‘high speed’ name. She asked the delegates to consider how they could get involved through, for instance, taking apprentices, guest lecturing, offering work experience and/or mentoring to students, donating specialist kit and equipment and arranging site visits. She issued an open invite to visit the collage sites in Doncaster and Birmingham. The next speaker talked about some of the specialist kit that has been developed for the rail freight industry. Daniel Copley, Business Development Manager, Weighwell, explained how the company’s portable weigher is slotted into an existing rail line and can be used for both static and in-motion (3mph) weighing to record weight of wheels, axles, wagons and the train itself. Accurate measurements help reduce the incidence of derailment and so improve safety, he said. The Department for Transport’s Rail Freight Strategy identifies intermodal, construction and automotive traffic as the key growth areas for rail freight, said Ben Formela, Rail Freight, Rail Strategy, Reform and Analysis. He said it was important that we all work together to tell the story of rai freight and explain its benefits. His team will make sure that freight’s views are represented and understood in the Williams rail review and will advocate that the funds for mode shift revenue support are maintained beyond the current expiry date of 2020. 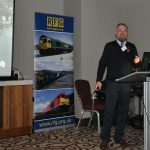 Patrick Talbot, HM Principal Inspector Railways, ORR, gave an overview of their role and how they work with HSE to regulate safety at railheads. He explained that the ORR intends to provide updated guidelines on the regulations relating to trespass incidents on freight sites which say companies must “prevent unauthorised access so far as is reasonably practical”. The number of incidents is unfortunately increasing. The Railway Inspectorate is the National Safety Authority for all railways including metro, tram and heritage railways, as well as bring the enforcing authority and it is also responsible for prosecuting cases. The meeting’s final speaker was James Fox, Commercial Director, 3 Squared who talked about digitisation in the rail freight sector. He outlined a few of his company’s products, including the mobile consisting application which was runner-up in the RFG Innovation Award category. This reduces the time to consist a freight train from 60 minutes to just ten, and creates a backend dashboard for KPIs and other reporting data. A new product is an Adhesion Digital Solution which provides route specific information about potential problems with weather, ice, leaves, etc. It includes a crowd-sourcing function which allows drivers to provide feedback about the accuracy what they have received and pass on updated information to drivers of following trains. 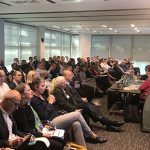 The meeting also included the RFG AGM where the result of a members’ vote for six board members out of eight candidates was announced and the articles of association were updated. Special thanks to the Port of Sunderland for supporting the event, arranging a tour of the port and giving delegates an excellent dinner the previous evening at the National Glass Centre.